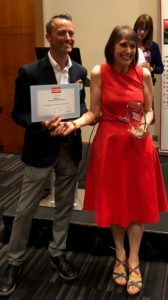 Eve Turner received the 2018 award for Contributions to Coaching Supervision in the annual Coaching at Work magazine awards in London on 4th July. The citation talks of her voluntary work, including setting up and leading the Global Supervisors’ Network (GSN), her work for the professional bodies, alongside her writing and research. She and Jonathan Passmore were also Highly Commended in the Best Article/Series category for their work on ethics and supervision. This has included developing an ethical decision-making model to support the work of coaches, mentors and supervisors. Eve says she is “thrilled and surprised to receive this accolade, among an outstanding list of nomineees, many of whom are members of the GSN.” She is delighted at the increasing recognition supervision is getting.